Whitcomb and his post-doctoral student Christopher McFarland’s technical efforts on this expedition focused on the development of NUI’s novel navigation, control, and acoustic telemetry systems, which were first prototyped on the Homewood Campus with Whitcomb’s underwater testbed vehicle, the JHU ROV, in his Hydrodynamics Laboratory in Krieger Hall. LEFT NUI being launched from the F/V Polarstern on NUI Dive #1 on July 21 – the first engineering dive in which the vehicle’s navigation, telemetry, and control systems were tested. RIGHT View from the forward camera of a small “rescue robot” as the NUI team practiced emergency vehicle recovery procedures on July 11, 2014. Happily, no such emergencies occurred. Out in the middle of of the Arctic Ocean, a German icebreaker, Polarstern, punches its way slowly through arctic sea ice to a spot just a few hundred miles shy of the North Pole. Polarstern is no mere icebreaker, however: It is a floating scientific laboratory. Aboard was a team of international scientists and engineers intent on exploring one of the last remaining scientific frontiers on Earth, the world beneath moving arctic ice. While it was this scientific vacuum that brought Whitcomb to the top of the world, he was not on Polarstern as a microbiologist or geologist but as an engineer. Whitcomb is one of the world’s leading experts in remotely controlled underwater robotic vehicles. 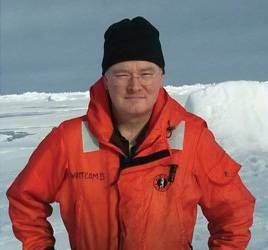 Whitcomb went to the Arctic last summer as the co-principal investigator, together with collaborators at the Woods Hole Oceanographic Institution, in the development of an entirely new underwater vehicle, called Nereid Under Ice. Nereid will allow researchers to observe the little understood and important ecosystems below the moving polar sea ice, under massive glacial ice shelves such as the Ross Ice Shelf in the Antarctic and, at greater depths, in the immediate vicinity of the mid-ocean ridges such as the Gakkel Ridge of the arctic seafloor—where the Earth’s fiery interior meets near-freezing seawater. Whitcomb has invested more than 20 years of his life imagining and guiding the development of technologies necessary to operate in some of the most extreme environments on Earth. He made a name for himself as co-principal investigator on the development of several novel underwater vehicles such as Nereus, the remotely controlled underwater vehicle that, in 2009, went to the bottom of the Challenger Deep in the Mariana Trench, the deepest point on Earth. The month-long expedition aboard Polarstern targeted an altogether different, but no less forbidding, environment in the upper water column under multiyear moving arctic sea ice. This is a magical and unfamiliar world. Each summer, bolstered by round-the-clock daylight, the waters below the Arctic’s azure floes grow cloudy with blooms of phytoplankton that soak up the sunlight that penetrates the ice. These uncountable single-cell plants are the base of a food web in the Arctic Ocean that weaves itself outward and upward from microscopic animals to the fish and the birds, through the pinnipeds and polar bears, all the way to whales that are among the biggest creatures ever to traverse the planet. “The underside of the ice was dotted with dark algal blooms and the sea becomes thick with life. The water is almost gelatinous, there is so much life,” says Topher McFarland, a postdoc in Whitcomb’s lab and a specialist in underwater navigation systems who also traveled aboard Polarstern. As fascinating and fundamental as this photosynthetic ecosystem is, however, it may ultimately pale in comparison with what transpires at the sea bottom on a jagged scar known as the Gakkel Ridge. Undersea volcanically active mountain ranges like this are where new seafloor is minted by the minute as the Earth’s molten interior surges upward, creating new ocean floor at the ever-so-leisurely pace of a few centimeters per year. The heat from inside the Earth creates thermal vents where warm, chemical-rich water and gases spew out. This environment is perhaps more forbidding even than the icy waters above. Seawater at the vents can reach a searing 662 degrees Fahrenheit, even in the Arctic, and it is packed with sulfides, methane, and other inner Earth chemicals. “Of all the environments on Earth, this comes closest to science fiction,” says Whitcomb. The world first became privy to this region in 2003, when geologist Henrietta Edmonds and collaborators published a foundational paper describing the evidence for the existence of hydrothermal vents spanning the entire Arctic Ocean along the length of the Gakkel Ridge. More than a decade later, the Gakkel Ridge has been visited by only a few expeditions and remains an elusive target to study. Nereid holds the promise of enabling scientists to have a closer look. While Whitcomb and the Nereid team were aboard Polarstern mostly to test their brand-new vehicle, someday Nereid will virtually transport scientists to other places below the ice—beneath the glacial ice shelves and under ice tongues of Greenland, Antarctica, Alaska, and elsewhere. These expansive features, which occur when glaciers meet seawater, are at the front line of climate change. Rapidly melting glaciers, it is believed, are contributing to sea level rise. An ice-shelf is formed where a glacier slides into the sea and melts from the sea bottom upward, causing a narrow wedge of water to form between seafloor and ice that can stretch hundreds of kilometers. Until now, the under-ice vehicles that could venture into these areas have been limited in mobility and functionality, Whitcomb says. Their capabilities are excellent for hydrographic mapping and water-column surveys, but they are unable to perform near-ice and near-seafloor optical imaging and intervention. Nereid, with its remarkable suite of scientific capabilities, will eventually change all that. “You can’t safely put a human-occupied submarine under an ice shelf. It’s too dangerous. There’s no escape route. But it’s perfect for underwater robot vehicles. Nereid can go there, complement existing technologies, and extend the scientific possibilities,” Whitcomb says. Years of research and engineering—and more than $4 million—have gone into creating Nereid. It is one of the most sophisticated under-ice vehicles developed to date. The month-long expedition aboard Polarstern was Nereid’s maiden voyage and so its research objectives, on this trip at least, were limited. Nereid’s first two dives under the ice (about five hours each) were principally engineering trials, where the team operated the vehicle for the first time under moving sea ice. Nereid’s third and fourth dives were devoted to scientific surveys in which Nereid conducted optical surveys to study sea ice physics, and conducted plankton surveys for biological oceanography. Nereid is known as a “hybrid,” meaning that it is fully capable of operating on its own—autonomously—or it can be operated remotely from the surface via a thin, lightweight fiber-optic cable. He not only oversaw the development of Nereid as a whole, but he also was personally invested in engineering systems that control the vehicle, its navigation, and the microfiber tether design, among others. Developed and built in collaboration with the Woods Hole Oceanographic Institution in Massachusetts and the University of New Hampshire, Nereid has been funded by the National Science Foundation, the James Family Foundation, and the George Frederick Jewett Foundation East. The team’s participation in the 2014 Polarstern expedition was made possible by the support of the National Oceanic and Atmospheric Administration, chief scientist Antje Boetius, and the captain and crew of Polarstern PS86. 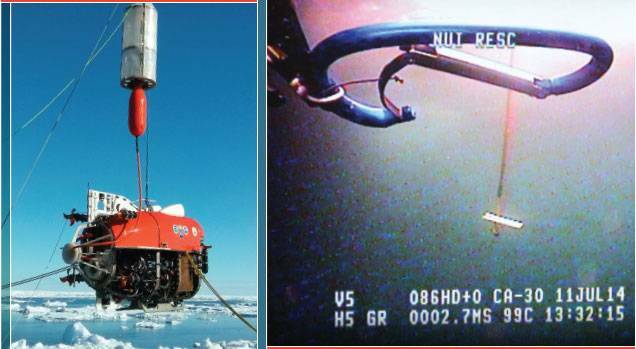 arm capable of plucking samples directly from the sea bottom, or taking samples from the ice. It will even be able to chemically test those samples while at depth using instruments mounted aboard the vehicle. Nereid also has many instruments designed to measure the environment around the vehicle, including Doppler-based sensors that are able to evaluate currents in the water. Other sensors will monitor temperatures, as well as oxygen and chlorophyll levels in the water column. Likewise, there are instruments able to measure the amount of light that makes it through the ice fueling the hungry blooms of algae with energy. Of all the cutting-edge engineering that went into Nereid, however, perhaps the most notable is the tethering system that uses a fiber optic cable just a few times thicker than a human hair. The tether carries high-definition video and navigational data back and forth to the mother ship at the speed of light. This cable provides a gigabit Ethernet data stream to the surface, as well as a high-definition video feed that will allow scientists to observe the under-ice world as never before and as close to firsthand as is presently possible. Nereid’s lightweight expendable tether enables it to have horizontal and vertical mobility that is not possible with conventional steel armored tethers, mostly used until now. These far heavier steel cables severely limit horizontal mobility and restrict a vehicle’s depth range to about 7,000 meters. Beyond that length, McFarland says, the steel breaks under its own weight. 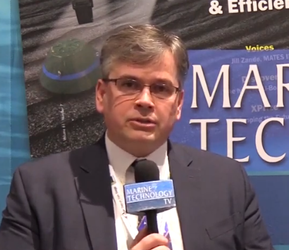 “The fiber optic system is based on the one we developed for Nereus, but the world below the ice presents some very different and difficult challenges. The ice is often jagged, pitted, and deeply contoured—all of which present the possibility of snagging,” Whitcomb says. Nereid’s tether is expendable. It is so thin and lightweight that 12 miles of it can be wound into a single canister the size of a lunchbox, greatly improving both Nereid’s economics and its range. The fiber costs about a dollar per meter, McFarland says. While such a figure is not exactly inconsequential—a single spool holds about 60,000 feet of fiber—neither is it prohibitive, should Nereid need to cut and run. The fiber itself is neutrally buoyant and simply hangs in the water, free to move wherever Nereid, or the water currents, takes it. The system employs two canisters, one suspended from the base ship above; the second trails behind Nereid connected by a hose—an umbilical, as the engineers call it. Each canister acts like a fishing reel with fish on the line: Nereid moves, the tension increases and cable spools out. The spool is so sensitive that surface tension between the water and the cable is enough to tug the fiber out of its cocoon. Unlike fishing reels, however, once the fiber is spooled out, it cannot be reeled back in. The cable pays out over a wheel that keeps track of the distance meted out. “It’s pretty exciting from an engineering standpoint. You end up with a vehicle that is free to move great distances both vertically and horizontally,” Whitcomb says. This is important because the dangers are many under the ice. Jagged floes are always nearby and at the bottom rock outcroppings could present snagging hazards. Whitcomb notes, as well, that he cannot rule out the threat of “biological aggression”—an animal masticating on or running into this lightweight tether. In the face of these many risks, Nereid is elaborately programmed with fail-safe mechanisms. “If the tether gets severed during a dive, Nereid will automatically descend to a pre-programmed depth below the ice and use acoustic communications to signal its position. Then the team sends acoustic commands to guide it back to its mother ship for recovery,” he says. as the vehicle approaches an object, and then farther apart—lower in frequency—as the vehicle moves away. “It’s like when an ambulance passes and your perception of the pitch of the siren changes as it goes by. This is the Doppler shift in action. If you know the frequency of the outgoing signal, you can use this shift in frequency of the returning signal to calculate the vehicle’s speed,” McFarland says. If Nereid is within 200 meters of the seafloor, it is able to get an acoustic fix. Or, it can use the ice above as a guide, though the ice is less accurate because it is in constant in motion. In a pinch, Nereid can even get an acoustic fix on particulate matter in the water itself. “Once you know Nereid’s heading, speed, and how long it’s been traveling, you can estimate a pretty accurate position,” McFarland says. While the summer trip aboard Polarstern was more test run than full-scale scientific endeavor, Nereid came through with flying colors. “Nereid did very, very well,” says Whitcomb. Louis Whitcomb brings to Nereid hard-won experience with the highs and lows of creating groundbreaking underwater robotic vehicles. He played a similar lead engineering role in the decade-long development of Nereus (rhymes with “serious”)—a research vehicle that, in 2009, reached the Challenger Deep, seven miles below the surface, the deepest point in all the oceans. Sadly, Nereus was lost in May 2014 on a dive to the Kermadec Trench near New Zealand at approximately 6.5 miles depth. Though no one knows for certain what happened, Nereus is believed to have imploded in the crushing deep-sea pressure that can reach an astounding 1,100 times that of the surface. Before she went down, however, Nereus logged some 76 missions over seven years, providing an unprecedented trove of scientific data from the deep. While Nereid was begun long before Nereus went down, the loss still stings and the lessons are sure to influence engineering choices as Nereid evolves. Nereid was not designed to dive beyond 2,000 meters, far shallower than Nereus, but, by the same token, Nereus did not have to contend with a thick icecap between it and the surface. “Nereus was a great proof of concept, and Nereid bears the unmistakable imprint of the lesson learned,” Whitcomb says. Reprinted with permission from the Johns Hopkins Whiting School of Engineering magazine JHU Engineering. Special thanks to the JHU faculty and staff and to author Andy Myers.